Automatic for 10 sq metres or more. Add dimensions / quantity to see price. Jump into action and design your own custom track suit pants. Choose from two stunning jersey fabrics, both carefully selected for their extremely comfortable yet body sculpting natures. Available from XXS up to 2XL plus size, design your own custom printed jogger pants and enjoy your workout like never before. With this cuffed female jogger pant you can move freely, without restriction and experience ultimate comfort. Design your own track suit pants, printed with your custom design. You have a choice of two beautiful jersey fabrics for your custom printed jogger pants. Rox Sports Jersey is a weft knitted, smooth fabric with astonishing stretch. Specifically designed for athleisure wear you get the best of both worlds with unrivalled comfort paired with amazing breathability. Our double-knit Ponte Jersey has fine rib detailing and offers supreme comfort and a generous amount of stretch. Super-soft to the touch ponte has natural figure hugging properties to accentuate natural curvature. At the height of both comfort and practicality whichever fabric you choose, you'll never want to take your female jogger pant off. With a 0.98" elasticated waistband and drawstring detailing, these custom track suit pants are designed to be worn wherever you find them most comfortable. Whether that is on the hips or at the waist, the versatile design allows for both. The side seams are home to pockets which are fully lined with Silk Sensation, and with ribbed cuffs and a slim fit leg, your printed jogger pants are perfect for lounge wear, outer wear or day wear. Weft knitted, breathable and stretchy. Double-knit, super stretchy, very soft. Planning on selling your designs on? 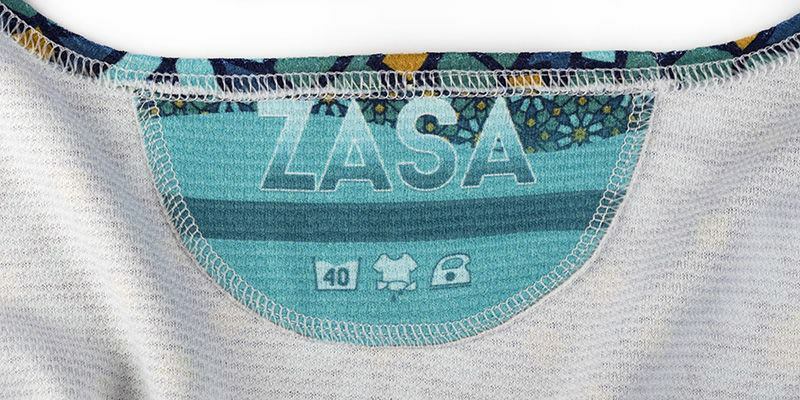 Why not add your brand name and information to a fabric label? This not only gives your personalized joggers a professional touch but each label is handmade at the same time as your trousers, custom made the way that you design it so you can even personalize it with a message or your customer's name. Begin building your brand and becoming recognizable with out custom fabric labels. These custom track suit pants are perfect when paired with a bomber jacket, sweatshirt or hoodie to create your own tracksuit. Due to the wide leg and cuffed ankles of the joggers the bomber jacket works seamlessly at creating a look that makes a statement or is just plain eye catching. Wash at 30°c, low tumble dry heat, hang to dry, do not wring, low heat iron. Create a brand. Create a store. Make a living. Join our vibrant community of online sellers and start earning. Our online marketplace for designers is free to join and allows your designs to reach audiences around the world. Contrado gives you access to our wide range of beautiful, handmade products, all waiting for your prints. We take care of making, printing, shipping and customer service so you can just create. Can I choose the drawstring color? The drawstring of your custom tracksuit bottoms is selected when you choose the color of your top stitch thread. It will either be black or white, and this will be in line with the thread color that you choose. Can I tighten with the drawstring? 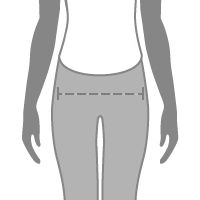 The drawstring on these female jogger pants is decorative, which means it won't tighten or loosen the waistband. It is finished with an elegant toggle that adds to the grace of the garment. Are these for sport or comfort? Both! As we're sure you'll agree, nobody wants to do a workout when they feel stifled and uncomfortable, so why choose? These custom tracksuit bottoms are for both athletics and leisure. Explore Joggers designs in our curated marketplace, created by independent artists and designers. Measure around the fullest part (across buttocks). 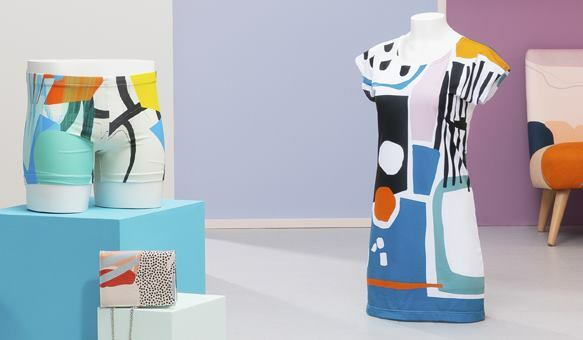 Design your Own Fabric, with Contrado! from Contrado on Vimeo. We print at 200dpi, which is a good combination of quality and file weight. Ideally your image should be scaled to 100% at 200dpi, this means that no resizing of your file occurs stopping any interpolation. For multi-colored or very detailed files we recommend using a tiff format, but they must be flattened. For simple colors and low detail files, a jpeg is fine. If each individual color is specifically important to your design, choose CYMK as our setup will print each color with the closest possible match within our available range. If the relationship between the colors within the image is more important choose RGB, this will reduce all colors equally to fit within our range. Grams per Square Meter (GSM) is an international standard for measuring the weight of paper or fabric. GSM uses the weight of a square meter (1000 x 1000mm) as an indication of the weight and thickness of a given fabric. We class 20-100gsm as light (summer fabrics, gauzes and fine silks), 101-249 gsm as medium (most clothing fabrics) and 250+ gsm as heavy (upholstery fabrics, and other specialist fabrics). To convert GSM to Ounces per square yard you just have to divide by 33.906, or if the fabric weighs 5.5oz/sq yard, to get grams/sq meter, you do this 5.5 oz/sqyd x 33.906 = 186.483 gm/sqm. When designing your product, it’s best to make sure that your image is slightly larger than needed. In printing, the extra printed image is referred to as a “Bleed Area” or margin, and it is removed from the finished piece. A bleed area acts as a buffer for slight inconsistencies in the manufacturing process. however, it’s important to fill your bleed areas completely, or you may end up with white, unprinted strips along the edge of your finished product. 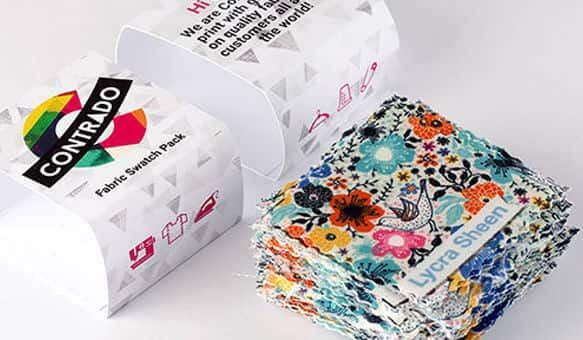 Do you print on garments a customer supplies? Unfortunately not. All our garments are printed on flat fabric, and sewn into finished products, which gives a better finished result and all-over print. We test meticulously so that we know what gets best results on our fabrics, and our facilities cater perfectly to them. We do however print sublimation paper to order, so if you have access to a heat press you can press your fabrics or flat garments easily. Can you Align a Pattern or design across panels of a garment? We always strive for the greatest accuracy when printing and constructing your garments. However, due to unavoidable stretch or movement of the fabric during the stitching process, we cannot guarantee perfect pattern registration across garment seams. We are generally accurate within 2-3mm / 0.8-0.12", which Is close enough for most patterns, but may show slight issues with detailed geometric patterns. Can I print my own Labels? Most of our garments now come with printable label space for you to add your own company information and branding. 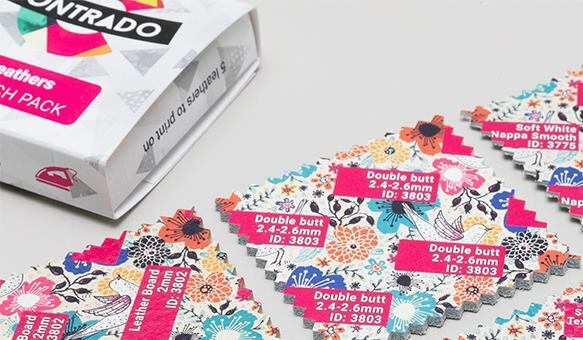 If you would like to sew in your own labels, we also offer Printed Fabric Labels here. Why is there a barcode inside my clothing? Due to our internal processes here at Contrado, there will be a barcode printed on your garment. This is inside the clothing and will not affect your design. It is usually found towards the bottom. With environmental consciousness in mind, our fabrics are all printed using completely water based inks. This means no chemicals or solvents are used. Our heat fixing procedure fixes the colors and prints, avoiding the downsides of steaming, such as excess or contaminated water returning into the waste system. We have one facility where we conduct all the printing, production and fulfillment. At Contrado, every product is handmade on site to ensure the highest quality. We provide a dedicated production service as well as a range of fast delivery options. Since 2003, we have printed and hand-made countless personalized products for a wide range of customers all over the world and many of them have become loyal customers who love not only our products but also the care, knowledge and dedication from our staff. Here is how it works. We first hand-make your item on average within 1-3 days depending on the product manufacturing timeline and quantities. After production time, we ship your order so you can receive it very quickly, subject to the delivery type you select in your basket. You can then enjoy or resell your hand-made products with your very own designs.